Maestri on the mound as a starter. The article in Abl website. 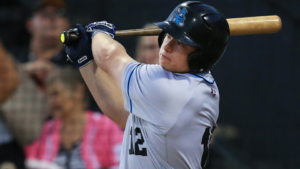 Sydney ended a nine-game losing streak against Brisbane on Friday night, riding late runs to a 5-4 win at OneHub Stadium powered by Optus to prove they are true contenders for the championship this season. A two-run homer from Donald Lutz gave Brisbane the lead in the first inning and they went 4-1 up but could not shrug the visitors. The Sox fought back in the second inning, scoring their first run through Zac Shepherd to cut the margin in half. A Bandits’ pitching change at the top of the fifth inning saw Ryan Searle replace Sam Holland, who struck out Sydney’s Jack Murphy and Zac Shepherd. But Sydney hit back hard again, scoring two runs on Michael Campbell’s single. After both teams failed to score a run during the sixth and seventh innings, Hao Wei Shen scored for Sydney at the top of the eighth inning, closing the gap on the scoreboard. A double from Jacob Younis allowed Alex Howe to score, putting the Sox out in front. Todd Van Steensel left the bases loaded in a drama-filled bottom of the ninth as Sydney avoided a 10th-straight loss to the three-time defending champions. Earlier, David Sutherland also homered on a fly ball, while TJ Bennett singled, before being caught stealing second base, providing an eventful third inning for Bandits fans. The series continues tomorrow afternoon, with a doubleheader scheduled to start at 2:30pm in Brisbane.